Whilst attending a conference on Swarm Robotics in Brussels I got a chance to play Daniel Palmer’s work in progress, Emergent. This is a cooperative game, where each player’s hidden objective must be met in order for the players to win the game. The only way the players have a communicating if their objective is met or not is with a two sided card; one side of the card is green representing ‘clear’ and the other red representing ‘blocked’. The player keeps this card placed in front of them and changes which side is facing up based on the current state of the game. Additionally, the players must also have placed 12 cards down on the 4×4 grid in order to win. 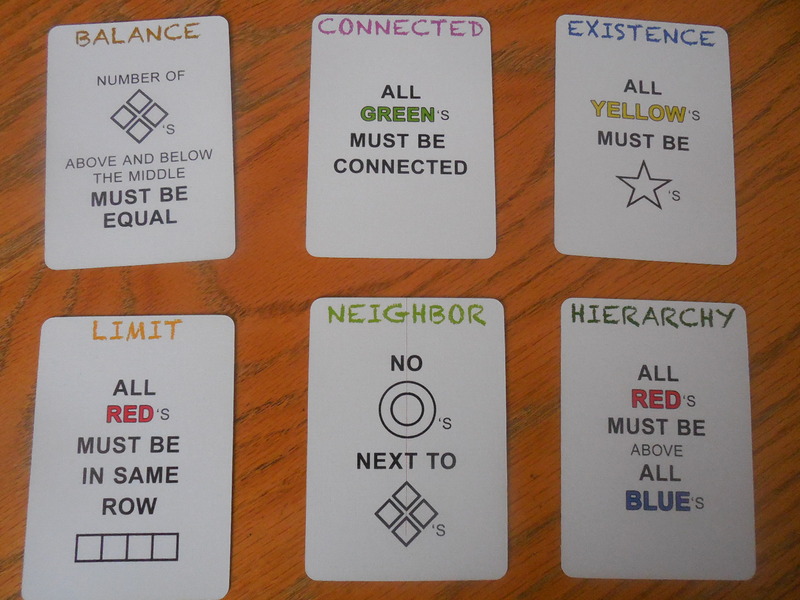 The cards that are required to be placed have 16 types, a combination of 4 colours (red, blue, green, yellow) and 4 symbols (star, square, diamonds, circle). At the beginning of the game 4 of these cards are randomly selected and randomly placed on the grid. Placing card(s) taken from stock piles. Removing card(s) from the grid to the discard pile. moving a card to a new position on the grid. 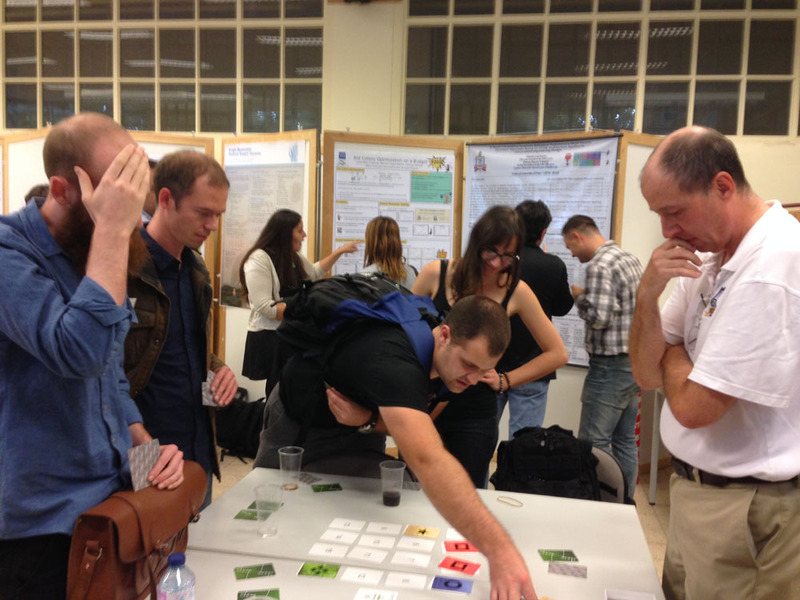 The rest of the players then vote on which of the two options the prefer, majority wins with tied votes decided by the player suggesting the options. This process is helped by handy double sided cards which have ‘place’ and ‘remove’ written on them. What ever the outcome, two cards per turn are removed from the stock of coloured cards to the discard pile, which act as a timer for the game as well as resources. The next player is the next person clockwise who is blocked. In the case that no one is blocked the next player clockwise takes a turn. During the game you are allowed to discuss and speculate upon other player’s objectives, but not to confirm/deny/hint at your own. Your voting preferences may give some indirect hints to the objective you may have. I managed to have two games in which we beat the game the first time and lost the second time. 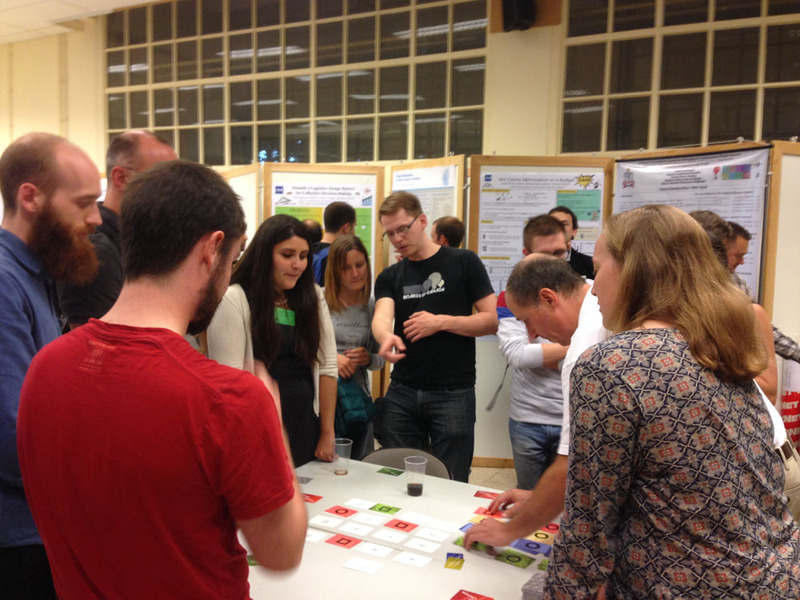 I do not know how much our game was helped by the fact I was playing with a group of computer scientists. Overall, I really enjoyed playing the game and it brought to my mind Hanabi by Antoine Bauza. I thought the individual hidden objectives was a really great concept, and the player turn order was well worked out. I suppose one issue could be that you never take a turn, but that does not mean that you are not taking part and speculating on other people’s objectives. One thing that seemed to confuse a number of players, was when it came to dealing with the outcomes of specific votes. This happened especially when the player’s two suggestions were to remove one existing card and to place one new card. The players often voted to remove the card and were shocked to see the card that has ‘place’ on it also removed (as this was the option that was NOT taken). There just seemed to be some sort of mental block on this issue. Daniel is still testing options on what to do with this. My suggestion was that when ever an option is voted upon, the alternate option’s ‘remove/place’ card is flipped. Then the players carry out the instructions on both the ‘remove/place’ cards (i.e. their voted option, and NOT the other option). Whether this would actually help or not would not be clear without testing. I think if the rule book comes with a really clear way of explaining the steps in this part of the game, after a couple of goes the players will get the hang of it. My second suggestion was that the cards that are currently numbered 1-16, that make up the grid, could contain more useful information on them. They could show which directions are considered ‘above’, ‘below’, ‘left’ and ‘right’. 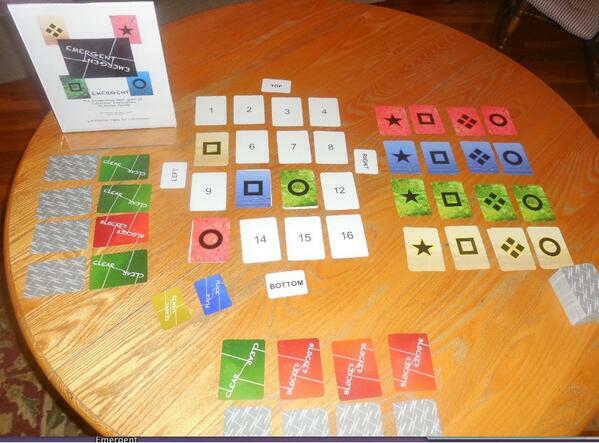 Additionally they could also include which are the four random starting positions at the beginning of the game. When I last spoke to Daniel he was looking to create a Kickstarter for this project sometime in the next year and when he does I’ll be sure to back it. Just like any game I’m not sure this is for everyone but it really pipped my interest, and I wish him all the luck for the future. This entry was posted in Play, Tabletop Games and tagged card game, Daniel Palmer, Emergent, kickstarter, play, playtest on September 28, 2014 by davidpeterking. Persistent Non-Visible Physical Truths – a new play mechanic?